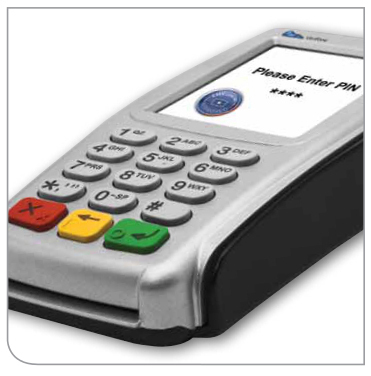 The VeriFone VX 820 PINpad provides the perfect solution for processing PIN-based transactions. It easily connects to the VX 520 countertop terminal as a customer -facing PINpad and is ready for the future of secure EMV “chip” cards,protecting you and your customers from counterfeit card fraud. The VX 820 also has integrated Contactless technology that extends the convenience of “tap and go” payments and prepares you for the acceptance of mobile wallets. Its sleek ergonomic design illuminated backlit keypad makes it easy for your customers to use. Sleek,ergonomic design occupies minimal counter space and provides easy handling. Illuminated keypad results in fewer customer input errors. Supports latest security standards for PIN-based transactions. Are you paying too much to accept credit cards?